I am currently a PhD student in Information Technology at Politecnico di Milano. I completed the Master of Science in Computer Engineering at Politecnico di Milano in 2013. My research interests focus on NoSQL databases and distributed systems. Specifically, I am interested to explore how to migrate and replicate big volumes of data across NoSQL databases, trying to avoid vendors lock-in. Design and development of a cloud architecture supporting scalable back-ends, handling social-media applications and adopting the Social BPM approach. Design and development of an offline data migration system for heterogeneous NoSQL databases, in the context of an European FP7 project called MODAClouds. NoSQL databases deployment to support the development of mobile applications based on social networks data (in collaboration with University of Trento). The problem my research deals with is that of data migration and synchronization (techniques) for distributed and data-intensive applications, which rely on column-based NoSQL databases. The importance of this research is well justified by the recent growing necessity of applications that should be able to store and process huge amount of unstructured and semi-structured data, generated at an ever-increasingly high speed; in short named BigData. The applications generating BigData are mainly those in the field of Internet-of-Things (IoT) and social networks. Given the large amount of data and the speed at which they are generated, data intensive applications need to use data storages able to horizontally scale and capable of handling the data efficiently. For these reasons, a plethora of different distributed NoSQL databases exist, each one differing in the characteristics it offers. Because of the lack of standards for NoSQL databases, and the different use-cases they address, in the last few years, we have witnessed an exponential increase of such NoSQL database solutions. This phenomenon brought each vendor to define its own query-language, storage approach (indexes, consistency guarantees, fault-tolerance, availability, etc.) and data formats. Moreover, together with the growth of the Cloud, vendors have begun to offer these NoSQL Databases as-a-Service (DaaS). All of this makes it difficult to: a) create portable or multi-cloud applications; b) predict the application behavior, since it strongly depends on the database technology which is being used; c) create and manage polyglot-persistent applications (i.e., applications which rely on different databases to work); d) extend the application to support new operations, different from the ones originally expected (when the application was designed in the first place). provide quality assurance during the application life-cycle and support migration from Cloud to Cloud when needed. Seamless adaptive multi-cloud management of service-based applications. Support orchestration, adaptation, and verification of services distributed over different Cloud providers. Provide a unified Cloud-independent mechanism to manage cloud-based services distributed over different Cloud providers. Enable monitoring and runtime reconfiguration operations of services distributed over different Cloud providers. 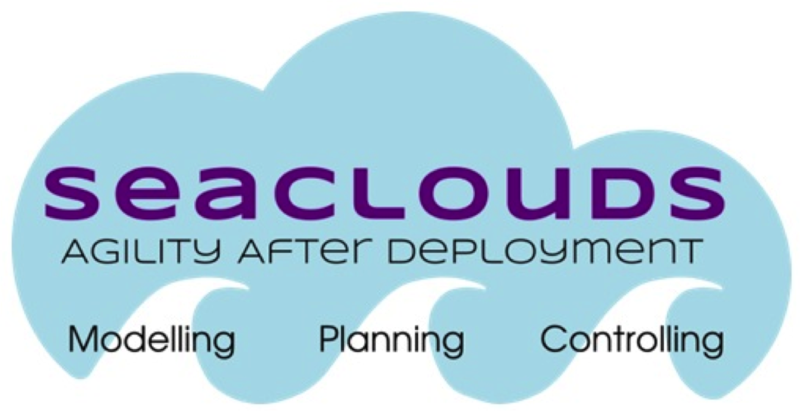 Align SeaClouds with major standards for cloud interoperability, particularly OASIS CAMP and TOSCA, promoting them in research and industrial communities. Nowadays, thanks to the massive usage of the Cloud, different providers offer storage as a service solutions. Each of these solutions is characterized by different storage capacity and features. They are also offered according to various business models; typically, users can choose between free plans (with a limited amount of space) and paid plans. Free plans users, when the storage capacity lowers, tend to subscribe to new free plans from other providers, thus increasing the so called data fragmentation. 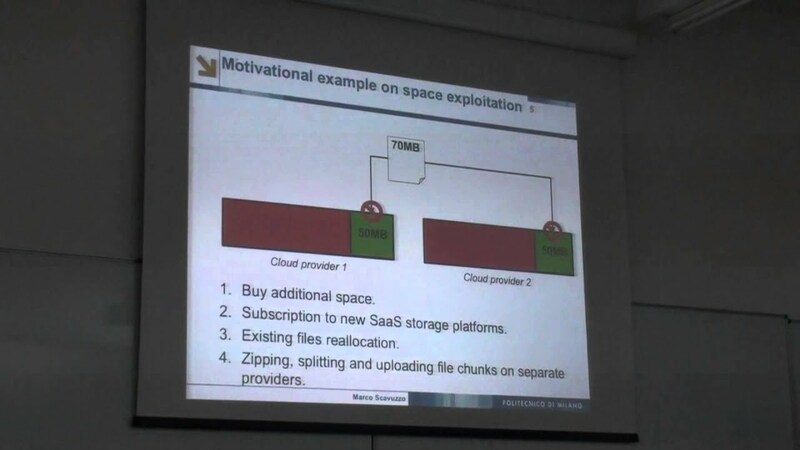 This phenomenon heavily increases the file management complexity.This paper proposes a solution to the data fragmentation problem, by describing an innovative approach which allows to deploy a distributed file system on top of different SaaS storage accounts, offered by different providers. This approach, not only lowers the complexity of data management by providing a single transparent storage solution to the user, but it is also able to provide features like full-text search, file classification and categorization, data analytics (MapReduce) on top of these SaaS storage accounts. Furthermore, this approach proposes a new way to address data privacy and security issues, typically connected to SaaS storage accounts. NoSQL databases have emerged as the solution to handle large quantities of user-generated contents still guaranteeing fault tolerance, availability and scalability. Each NoSQL database offers differentiated properties and characteristics as well as different data models and architectures. As a result, the development of applications exploiting such kind of technology is strictly dependent on the specific NoSQL solution being adopted, and the migration from a NoSQL to the other requires the development of ad-hoc code managing the transfer of data. In order to mitigate such issue, this paper proposes an interoperable migration system for columnar NoSQL databases. The proposed approach is based on an orginal Metamodel, capable of preserving both strong and weak consistency between data updates, secondary indexes and various data types. Moreover, the approach allows developers to easily add support for new databases. Data Intensive (DI) applications are becoming more and more important in several fields of science, economy, and even in our normal life. Unfortunately, even if some technological frameworks are available for them, we still lack solid software engineering approaches to support their development. In this paper we report our experience in developing and optimizing a DI application that migrates data between well known Database as a Service systems. We highlight the issues we have faced during the design and development activities and identify some open challenges that could generate new research in the areas of software design and verification. Conference Papers Proceedings of the Second International Workshop on BIG Data Software Engineering, Austin, TX, USA, 2016. The recent growing interest on highly-available data-intensive applications sparked the need for flexible and portable storage technologies, e.g., NoSQL databases. Unfortunately, the lack of standard interfaces and architectures for NoSQLs makes it difficult and expensive to create portable applications, which results in vendor lock-in. Building on previous work, we aim at providing guaranteed fault-tolerant techniques and supporting architectures to port or migrate data to and across heterogeneous NoSQL technology. To prove the effectiveness of our approach we evaluate it on an industrial case-study. We conclude that our method and supporting architecture offer an efficient and fault-tolerant mechanism for NoSQL portability and interoperation. Data Intensive (DI) applications are becoming more and more important in several fields of science, economy, and even in our normal life. Unfortunately, even if some technological frameworks are available for their development, we still lack solid software engineering approaches to support their development and, in particular, to ensure that they offer the required properties in terms of availability, throughput, data loss, etc.. In this paper we report our action research experience in developing-testing-reengineering a specific DI application, Hegira4Cloud, that migrates data between widely used NoSQL databases. We highlight the issues we have faced during our experience and we show how cumbersome, expensive and time-consuming the developing-testing-reengineering approach can be in this specific case. Also, we analyse the state of the art in the light of our experience and identify weaknesses and open challenges that could generate new research in the areas of software design and verification.